Richard Kurti is a screen writer and director for television as well as an author. His first book, Monkey Wars, was shortlisted for the Hounslow Teen Read a couple of years ago and I had to read it. Now, I wouldn’t say this was a chore but if you have read my review of it then you will see that it wasn’t one of my favourite books. I think that I said it was a bit silly. That is not something that you can accuse this book of being. 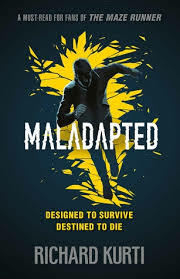 Maladapted is set in the near future. Cillian is a 17 year old boy who lives with his father, Paul, who is a doctor. He is exceptionally good at maths and has been fast tracked and is already at university. His brain seems to work differently to other people’s and he can problem solve like you wouldn’t believe. At the beginning of the book he is travelling on the train with his dad when there is a terrorist explosion and everyone on the train dies, including his father – except Cillian. Tess is an orphan who has been indoctrinated by a strange religious order called Revelation. They believe that the world has been taken over by too much tech and it is against God’s wishes. They want the world to go back to the way it was. Tess and Cillian live in Foundation City, a new kind of city where everything is really modern. This is at a cost to the old way of life and the people that live there. Everything is controlled by technology and you are followed and accounted for all the time. Even if you look at a shop it’s picked up and the authorities can track your movements. Revelation have also heard about a secret government program called P8 which they think is developing children with superhuman abilities. Can you see the connection yet? Tess is involved in the bombing on the train and, once Revelation think that have found a live test subject from the P8 program (Cillian) they get Tess to befriend him to find out what he knows. The book is written like a high octane film. You can almost imagine what the film will be like. Cillian and Tess go off and explore various things, manipulate people and print off a 3D gun (Cool eh?) and try and find out what is going on. It is definitely the first in a series as the book ends on a cliff hanger. It’s a little bit too disjointed for me and some of the characters were not really fleshed out. I would like to find out more about Cillian’s Dad and how he became involved in the program. Also, the last chapter was full of twists that will make you want to read the next one, so it’s clever. All in all, I enjoyed it 100 times more that Monkey Wars. And it’s not silly at all….